At Any Given Moment, Fall 1 with Volcanic Rock is an architectural scale video art installation consisting of video projection, sound, and 4 tons of Volcanic Rock. Duration: Continuous loop. Size: Variable; site specific. Shown above at ‘Energy’, group exhibition at the Alyce Williamson Gallery. Size: 21ft 8 in x 18 ft. Duration: 9 minutes. The At Any Given Moment series explore issues of perception, specifically our relationship to technologically mediated nature. In At Any Given Moment, Fall 1 with volcanic rock, the repetitive rhythm, tight cropping, and large-scale image emphasize the work’s particular organizational logic in time and space. The cross-rhythmic tensions between simple elements—water flowing at variable speed and under variable light conditions—create visual difference and reveal the patterns that one simple element produces through relationships and complex organization. This distancing approach allows us to view ourselves from the outside—as part of the representation—and thus to learn about ourselves and challenge preconceptions of our surroundings, specifically of the nature of matter. The At Any Given Moment series is ongoing and is filmed in various locations, from Iceland to Norway and the US. It is filmed with a Bolex H16 Reflex 16mm film camera and transferred to high-definition video. At Any Given Moment, Fall 1 was filmed in Iceland. Sound by Drew Schnurr. At Any Given Moment, Fall 1 with Volcanic Rocks, 2010. Video art installation consisting of a video projection measuring 22×19 feet, 3 tons of volcanic rock, and sound by Drew Schnurr. Installation view at ‘Energy’ group exhibition at Alyce de Roullet Williamson Gallery, Pasadena. On view from October 07, 2010 through January 26, 2011. Installation Documentation at the Alyce de Roulet Williamson Gallery, Pasadena, California. Exhibition dates: October 7, 2010 – January 16, 2011. Curator Stephen Nowlin. 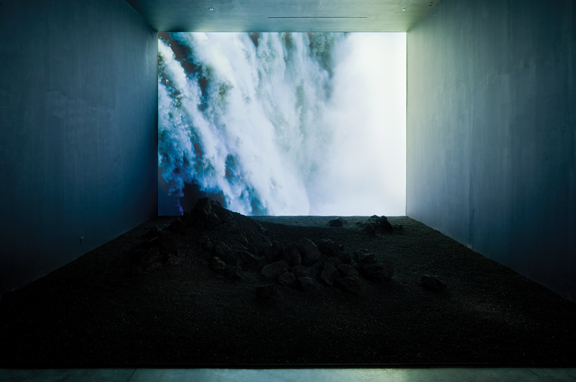 Installation consists of video projection, sound, and 4 tons of volcanic rock. Projection size: 21 ft 8 in x 18 ft. Duration: 9 minutes. Continuous loop. Sound by Drew Schnurr.